In 1965, the Rover Motor Company was a successful independent carmaker, producing well-regarded luxury saloons and a range of highly capable off-road vehicles. However, its flagship P5 saloon was dating and lacking the resources to replace it, Lode Lane’s developmental head, Charles (Spen) King, working under the guidance of Peter Wilks proposed a modular range of cars to be derived from a single base unit. The work carried out on the highly acclaimed 1963 P6 saloon model would underpin much of the new cars’ thinking. So a stressed steel base unit was proposed, with outer panels bolting into place, allowing alternative styling for upper and lower-end models. Power was to be provided by versions of Rover’s existing in-line 2.0 litre four and the 3.5 litre V8 being re-developed from its Buick origins. Suspension would employ a subframe-mounted double wishbone set-up at the front, while aft, a new design of de Dion layout was devised which would ultimately incorporate a hydraulic ring-main to provide self-levelling, power braking and steering, à la Citroën. Anti-lock braking was also envisaged for the model. While the business case for the car (dubbed P8) was apparently sound, it existed largely on paper, but in early 1967, Leyland acquired the Rover business, precipitating a product review which would radically alter P8’s course. Viewed by Leyland’s then CEO, Donald Stokes as a potential Mercedes rival, he pressed for the programme to be refocused to push P8 upmarket. The smaller engined models were dropped, with the V8 now being the sole powerplant in 3.5 and 4.4 litre versions. Later that year, Leyland and its embattled rival, British Motor Holdings (BMH) were press-ganged into marriage by an interventionist UK government, creating the BLMC leviathan. Yet despite the fact that P8 would now compete directly with the ‘in-house’ Jaguar XJ6, development proceeded, with the car set to debut in 1971. The styling of the big Rover was the responsibility of Solihull’s David Bache, the man responsible for the P5 and P6 saloons (and later the acclaimed SD1). A visionary designer, his styling team proposed a somewhat heavy-set saloon in the American ‘muscle car’ idiom. The most notable styling feature of the finalised design was its integrated, body coloured polyurethane over steel armature bumper units, which were influenced by the so-called ‘Endura’ bumpers fitted to contemporary Pontiac models. The P8 interior was the work of Rover designer, Geoff Perkis, who was also responsible for the impressive cabin design of SD1. Like the later car, P8 employed a somewhat stark, product design aesthetic with an emphasis on simplicity, sound ergonomics and an unusual, almost ‘quartic’ steering wheel. The following year, tooling was ordered from Pressed Steel Fisher and proving began in earnest. However, the 1971 launch date began to slip. Meanwhile at BLMC board level, a battle of wills was said to have ensued; Jaguar’s Sir William Lyons allegedly making his views about P8 plain. Of course when BLMC was created, the XJ6 had yet to be announced and commercially speaking was still something of an unknown quantity. However, it cannot have been lost on Stokes and the BLMC board that Jaguar had a winner on its hands. Its subsequent critical success and Browns Lane’s failure to meet demand really ought to have concentrated minds at Berkeley Square. It certainly did that of Jaguar’s Chairman, who quite reasonably argued at board level for resources to be diverted towards Browns Lane to help Jaguar (and BLMC) capitalise on the XJ6’s success. But his entreaties appeared to fall on deaf ears – at least until a 1971 BLMC product review, which sealed P8’s fate. Central to this was the fact that not only did P8 perform somewhat catastrophically in barrier crash tests, but the base unit developed structural cracks during pavé testing which would have necessitated hugely expensive revisions and a further slippage of the further revised 1972 launch date. With around £5 million spent, the programme was abruptly cancelled. Lyons and Jaguar were subsequently accorded villains of the piece, believed to have connived to see the programme axed. But this ignores some uncomfortable realities. Rover maintained a strong reputation in the UK market at the time as purveyors of well-crafted, modernist luxury cars. However, they enjoyed little penetration across Europe and had consistently failed to make any meaningful inroads into the US market, despite glowing reviews for the P6 series of saloons. Furthermore, P8 was conceptually ambitious, technically complex and given the prevailing manufacturing limitations within the BLMC mothership at the time, unlikely to have been assembled to the required standards of a ‘Mercedes beater’. Moreover, Sindelfingen was on the cusp of announcing its W116 S-Class in 1972, a car which would quickly embody the state of the luxury car art. With the XJ range, BLMC already had a highly competitive entrant at the top end of the market, one which was in keen demand worldwide. The last thing they needed was an in-house rival. Especially one whose commercial prospects were an unknown and whose appearance was, to put it mildly, an acquired taste. Historian and author, Chris Cowin more recently punctured the conspiracy-theory bubble, stating, “If the P8 had been launched in 1972, it is hard to escape the conclusion that it would have lived an uncomfortable life, forever in the shadow of the Mercedes and Jaguar,” an assertion which is difficult to refute. Because the question which orbits around the P8 programme is not why it was cancelled in 1971, but why it wasn’t culled well before? The Rover was the wrong product, with the wrong styling at the wrong time and its undoubted commercial failure would have simply proven yet another sorry episode from British Leyland’s catalogue of ‘nearly’ cars. Given the financial strictures placed upon the BLMC business, the revenue squandered on P8 could potentially have transformed other parts of the business, least of all at Browns Lane, where expansion and modernisation was desperately needed – to say nothing of that highly sought-after slot at Pressed Steel. In every merger situation there are winners and losers. The P8 was a technically brilliant concept poorly clothed, but fundamentally it was too ambitious, and certainly too ambitious for BLMC at that time. But like all great lost causes, it lives on in our imaginations, its perfection complete in its incompleteness. It can never die because it never truly lived. The styling of the P8 strikes me like a Iso Rivolta S4 done by a child. If only Mr. Bache was able to mimic Giugiaro as well as he did Pininfarina with the SD1 the P8 would have been a winner. Admittingly the brutal styling would have probably become dated very quickly, perhaps Rover would have been better off having the Rover P8 take a cue from the then upcoming Range Rover with the latter’s styling elements. Before the project was moved upmarket it is curious the Rover P8 was to carry over the 2-litre OHC engine since it (and the later 2.2-litre version) was considered to be under-powered in the Rover P6, unless the engine was to be overhauled or replaced by the fuel-injected 2.2-litre DOHC 16-valve 4-cylinder unit later planned for the P10 project (aka SD1). An argument can be made the Rover P8 needed a 6-cylinder instead of a 4-cylinder, whether derived from the P7 unit or a V8-based V6. The P76 was remarkably similar looking to the P8, albeit shorn of some of the latter’s more aggressive details. It bombed in the market and survived just two years. There has been a good deal of speculation over the years as to the similarities between P8 and P76, but apparently, little on the chassis or body structure side was carried across – largely I imagine owing to cost implications. P76 was not intended to be an expensive programme. The main recipient was the 4.4 litre variant of the Buick V8, which was intended for P8. 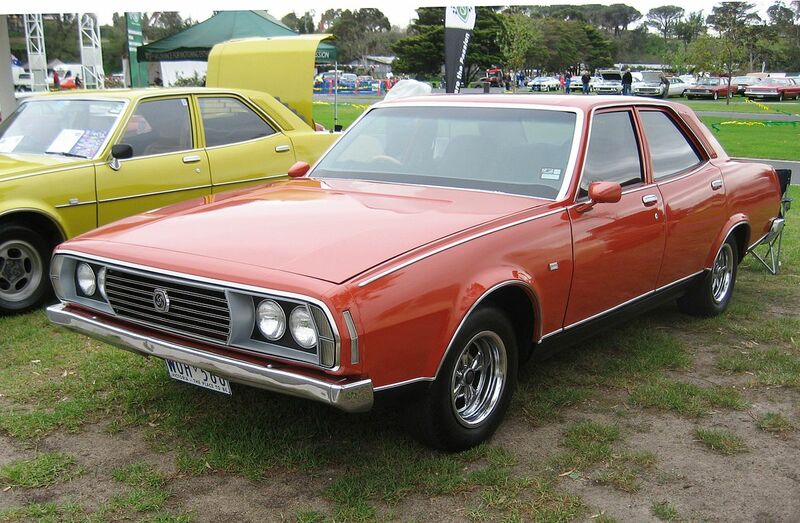 Allegedly, SD1 has more in common structurally with the P76, albeit the similarities even here are said to be minimal. In addition, while P8 was styled at Rover’s Solihull studio under David Bache’s supervision, P76 was said to have been the work of Michelotti – Harry Webster (BLMC Technical Director’s) favoured carrozzeria. Having said all that, there are similarities in stylistic approach, so it’s easy to see why one might reach that conclusion. Hi Eóin, I’m sure you’re right: both were probably just apeing the prevailing US design tropes, hence their similarity. That said, there is evidence of a “nose-cone” on the P76. Perhaps it might have been intended to accommodate a more sophisticated bumper arrangement than the simple chromed steel item it ended up with? More likely, it was a simple expedient, common on contemporary US designs, to facilitate a cheap facelift. I really like the boot and bootlid. It was nicely sculpted I think and it looked quite imposing and powerful. It reminds me of a boot for a Rolls or Bentley of the same era. That’s an Endura bumper on the GTO Judge, not Enduro. DeLorean featured himself on the TV commercial, whacking it with a 14 lb maul. No doubt that’s when the concept of his Back to the Future stainless steel wonder car occurred to him. The prototype P8 in the first picture is apparently loaded with half a ton of concrete in the boot, and that hood scoop is amateurish in shape even for the time. About like BL management in general. All these old prototypes that get recycled here and on AROnline remind me that the one thing the conglomerate never did was to kick some behinds and organize some central engineering and design, even assembly operations. The old petty fiefdoms (on a world scale) from the legacy carmakers were allowed to perpetuate, underfunded and understaffed, each begging for a few quid from Stokes for their pet project, while belittling the others. Nobody ever put their foot down and exerted control over these flighty individuals, who were certainly no business geniuses. They needed some discipline and reminder of the new company they worked for, but it was never really forthcoming. A squandered opportunity to modernize design and plant operations. But the old school tie won out as the whole enterprise creaked to an end for several decades producing in world quality terms, utter rubbish. I agree that, with hindsight, if BLMC was ever going to succeed, some very drastic changes were needed. It seems that Donald Stokes was never that sort of person – a salesman at heart, he tried to expand out of trouble. With the merged company in such a poor state that was probably the most dangerous strategy. They can’t have been serious about trying to sell a car looking like that. It seems to be a half ready garden shed experiment of crossing a tank with an already ugly car, even if the bonnet bulge of the white car looks much less brutish than that of the green example – the sagging boot of which is probably due to lack of pressure in the hydraulic system, just like in old Citroens parked for any length of time. I think the styling of the P8 is rather good for its time, although there does seem to be a mis-match between the somewhat angular front and soft rear. Earlier proposals for the car had less imposing, softer front styling. The ‘final’ front styling did have some innovative touches such as the ‘3-dimensional’ grille and badge. I do agree, however, that the styling would have aged quickly. I also disagree that the car would have been poorly built. Even in 1971 Solihull was staffed by many long-serving Rover employees who would have known how to ensure decent build quality – maybe not to Mercedes standards, but not bad. The problem with SD1 was that, by the time it launched, there was little remaining of the ‘old’ Rover. There is no question that when Rover was Rover, they produced, well-made, quality cars. The issue with P8 would have most likely have been more a consequence of the car’s sheer technical complexity and Rover’s reliance on the UK supplier-base, who at the time it seems were not in the quality business. It also would have been a difficult car to build accurately, not to mention, cost-effectively. Indeed, it’s difficult to understand how the business case for it stood up, cost-wise at least. Technically, it’s a fascinating car and really rather brave, but it was probably too much so. One has to feel for Rover though. They really were on a creative roll at the time, but they were very poorly served by the Leyland takeover. My thanks to Bill for the kind correction. It´s my general sense of artistic development that the production version is always definitive. Studio work stays studio work for a reason. I can´t think of a clay model alternative that looked better than the equivalent clay model used for production. This car is evidently so prototypish that it seems unfair to assume something looking quite that slabby would have made production. I am pretty sure that a suite of tweaks and nudges would have been carried out to knock some sense into it. I say that because it is in almost every way a really horrible looking car and I don´t believe it shows much of what Rover had in mind. This missing 1% or 2% of changes could have altered it 100%. I think the black model on the main picture really makes it look disgusting but It’s not so bad on the other pics. Sure, it’s challenging but I think the maquettes show a model that would have had a lot of character at least. There’s a hint of Ford Granada, which I believe came out years later. It was quite baroque in a way, it could have been an ancestor of the Maserati Quattroporte in that sense, it even had the ventiports. I meant a hint of Ford Taurus (1970s), not Granada sorry. I didn’t know the Toyota but yes definitely an air between the two. Glad I’m not the only one who thought it was a terrible looking car. Mind you, I’ve seen the photos of the P8 prototype in a damaged and derelict state at the British Motor Museum, and I certainly hope they’re planning on restoring it to its former glory. If P8 versus XJ6 was supposed to be a problem, then why wasn’t SD1 versus XJ6 seen as a ‘problem’? The styling was very much right at the time, I would suggest, and there are lots of cars of that period with great similarities that sold well. And it was very complementary to the very British XJ6, so would surely be capable of attracting different buyers to the XJ6 around the world. The catastrophe for this car appears to have been it’s structural flaws, as described in this article. When BLMC were struggling to make money, having to cobble together the Morris Marina from the Morris Minor parts bins to try to do so, I dare say that the P8 didn’t stand a chance of getting the money to be put right. The author’s suggestion that it was too ambitious just reflects what a decade had done to the core of the British motor industry, effectively the author is suggesting that the industry was incapable of competing – which only became a truth I would suggest because of the disastrous creation of BLMC. Had Rover had that attitude ten years earlier the P6 would never have been built, with its curious modernistic styling and complexities that are still appreciated today, and which compared favourably with competitors from Germany at the time. What would have happened to the P8 had Rover remained independent we will never know, but I think there are people who regret that they joined Leyland when they didn’t really need to. They presumably thought the resources of Leyland would enable them to expand and put into place the programme of advanced models they had planned. But the unexpected forced assimilation into BLMC brought an end to that, and in consequence an end to Rover other than as a badge to put on mundane and poorly built offerings thereafter. Thanks for your comment Mike and welcome to DTW. For a Rover aficionado (and I am making the assumption that you are), a piece like this probably comes across as needlessly critical and in parts, perhaps it is. It was not my intention to denigrate the car in conceptual terms or the engineering team who created it, more to highlight the flawed nature of the car that came close to entering production and to challenge the frequently-levelled assertion that its cancellation was the direct result of skulduggery from Browns Lane. As a more austere ‘Germanic’ rival to Mercedes, one could perhaps see the merit of such a vehicle as against Jaguar’s more traditional offer, but in truth, it’s inconceivable that BLMC could have justified both, as they would most likely have ended up cannibalising one another. Furthermore, of the two, only Jaguar had any meaningful equity in export markets at the time, which commercially speaking would have made all the difference. You ask why SD1 wasn’t seen as a threat. I’d contend that it was. Largely because, in product strategy terms – (certainly if one is to adhere to accepted marque hierarchies), the Rover came too close to Jaguar in positioning. Fundamentally a Granada/CX/Gamma/Senator (et al) rival, in 3500 V8 form, it was too large for its target market. Not only did this place it closer to Jaguar than was either comfortable or wise, it was prohibitively large in displacement for vast swathes of the European market, severely limiting its sales potential. Indeed, even the 2600 version sat well above many market’s tax thresholds. BL product planners made a huge error here. As mentioned elsewhere on this site, what SD1 needed most was a good 2-litre power unit (Triumph had two in both four and six cylinder form) and a diesel. Both eventually arrived, but far too late in the model’s lifespan. Rover and Jaguar were carmakers with a strong heritage and a sound reputation – (very sound in Rover’s case). Both had conceptual engineering teams of a very high calibre with the potential to produce leading-edge products. Both lacked the financial resources to do this alone and opted to join larger, better funded organisations who could potentially assist their ambitions. Neither got what they wanted or needed but of the pair, Rover came out by far the worst. They deserved a better fate, but I remain convinced that P8 was not the transformational product they required. Triumph had two 2 litre engines, but neither was entirely good. Both suffered from the endemic Standard-Triumph ‘halfpenny worth of tar’ problems. The Triumph slant-four was built to tolerances far too approximate for an OHC design – pushrods and easily adjustable screw tappets are far more forgiving. Saab made a decent engine out of it by handing it over to Scania to over-engineer. Rover had a promising four valve per cylinder 2.2 litre twin cam version of their SOHC four under development, but we’ll never know how effective it would have been – engines were never a strong point at Rover. Pre-V8, the good Rover cars were good in spite of their engines, rather than because of them. The real shame is perhaps that the 1978 O series engine didn’t get fuel injection and turbocharging until the 1984-0n Montego era. Neither were untried or alien technologies even in mid-1976, and both would have added breadth to SD1’s appeal. While Rover probably had their reasons for the unbuilt Twin-Cam displacing 2.2-litres, have always wondered whether the engine could have reverted back to 2-litres in order to access markets that penalized engines over 2-litres. Being an improvement over the P6 OHC’s (as well as significantly lighter due to apparently being all-alloy), it should have been possible for the 2.2 Twin-Cam to form the basis of viable 5-cylinder and 6-cylinder engines as was tested on the P6 engine prior acquiring the rights to the Rover V8. Another interesting fact to consider is that Rover were also offered the Buick V6 together with the 215 Buick V8 by GM, before the Buick V6 was snapped up by Jeep (and later bought back by GM). Previous Previous post: A Plate of Cozido a Portuguesa, Please.